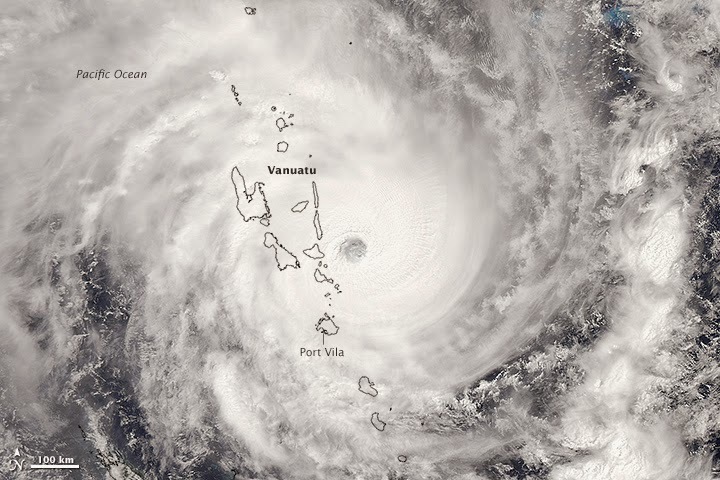 Tropical Cyclone Pam, a category 5 storm as measured on both the Australian and Saffir-Simpson storm measurement scales, with wind gusts over 300km/hr, has devastated the Pacific Island Nation of Vanuatu. The storm made a direct hit on the capital Port Vila of this island country on Friday night and the early hours of Saturday morning, causing widespread damage, blocking roads, power and communication outages and destroying many homes and buildings. Even the main Hospital in Port Vila suffered damage. Tom Skirrow from Save The Children says 10,000 people need emergency shelter in Port Vila alone according to Liam Fox, an ABC News Pacific Affairs Reporter. According to Radio New Zealand (@RNZNews) Vanuatu's Disaster Management Office says part of the country's main hospital, Vila Central, have been destroyed. This has been confirmed by Vanuatu's lands minister, Ralph Regenvanu, saing only one ward of Vila Central Hospital is still operational. The cyclone was one of the strongest ever recorded in the Pacific Islands with sustained winds of 270km/hr gusting to 360km/hr. The United Nations has stated that Pam could be one of the worst natural disasters in the history of the Pacific. Vanuatu’s President, Baldwin Lonsdale, has appealed to the global community for help. Thousands of people are in temporary shelters. Entire communities were severely damaged in some areas. Islands in the north and south of Vanuatu were hit most directly. Vanuatu has a population of 267,000 spread over 65 islands, with nearly 50,000 people living in the capital Port Vila. There are few reports yet of damage to other towns and villages, but the damage and death toll is likely to be even more extensive from these outlying areas and remote islands. Aurelia Balpe (@aureliabalpe), Head Pacific Office of the International Federation of Red Cross and Red Crescent Societies (IFRC) reported that in a "1st report private fly-over Tanna & Erramngo, trees uprooted, no corrugated iron structures standing, no roofs on concrete blds, no H20", A dire situation report. Also "Our @ShelterCluster coordinator also witnessed devastation on Tanna as NZ Hercules flew over earlier today". The Red Cross says an aid worker has made it to the island of Tanna, in southern Vanuatu, and has told of vast devastation, according to Radio New Zealand. Tuvalu, Kiribati, and the Solomon Islands have also been impacted by large storm surges and increased wave heights causing flooding, and torrential rain as the Tropical Cyclone passed through. The level of destruction from the flooding caused the Government of Tuvalu to issue a State of Emergency. Up to 45% of the population, mostly from the outer isles, are displaced by flooding caused by the storm surge. This flooding destroys crops and poisons the freshwater lenses that people depend upon to drink and for agriculture. Aurelia Balpe reported that "KiribatiRC reports 'many' houses destroyed by tidal surges on Tamana Island, many gathered in community maneaba 4 shelter." On the Solomon Islands several homes and a school were reported flood destroyed as well as crops destroyed. All these Pacific Nations are already feeling the impacts of climate change in rising sea levels, increased torrential storms producing flash floods and landslides, and increased droughts. The increase in intensity of Tropical Cyclones is particularly devastating when they make a direct hot like on Vanuatu. One of the drivers of cyclone intensity is increased sea surface temperatures, and the tropical Pacific has had above average water temperatures which passes energy to enable the cyclone to intensify rapidly. 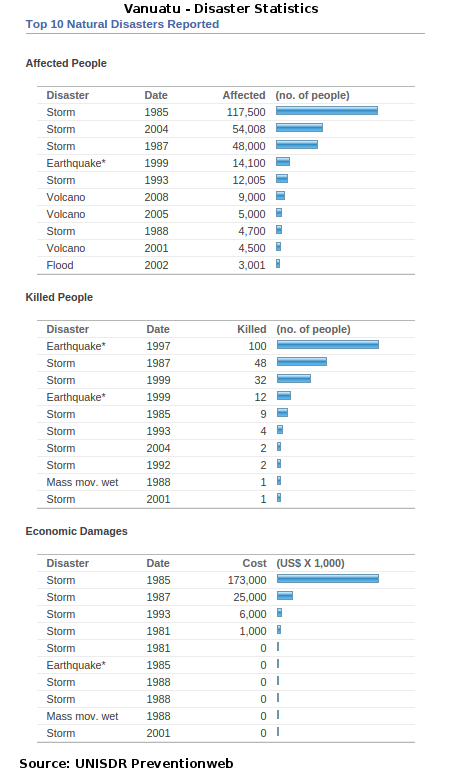 Vanuatu presently ranks number one on the list of disaster vulnerable countries. The devastation by this Category 5 cyclone is at a scale of disaster well beyond the means of local agencies and the government of Vanuatu to cope with. The last several years strong efforts have been made in emergency planning, disaster risk management and preparedness, but communities outside the capital of Port Vila are particularly vulnerable due to lack of government services and reliance on subsistence farming for survival. The storm has taken out much of the countries communications systems and also washed away roads and bridges for accessing more remote communities. It is estimated that the entire population of 220,000 people are affected in some way. Major rebuilding will be required, including supply of food and water while much of the subsistence agriculture is re-established. "Vanuatu is used to disasters but the indications are that Cyclone Pam has caused unprecedented damages...This is a major calamity for our country. Every year we lose 6% of our GDP to disasters. This cyclone is a huge setback for the country's development. It will have severe impacts for all sectors of economic activity including tourism, agriculture and manufacturing. The country is already threatened by coastal erosion and rising sea levels in addition to five active volcanos and earthquakes. This is why I am attending this Conference and why Vanuatu wants to see a strong new framework on disaster risk reduction which will support us in tackling the drivers of disaster risk such as climate change." While earthquake disasters have tended to cause more mortality, storms have had a much larger economic cost on the country according to disaster statistics. But Cyclone Pam being an intense Category 5 storm making landfall in the archipelago where both wind speed and storm surge could cause maximum destruction, is likely to exact a very high rate of mortality and economic losses. During the 2014 budget handed down by Australian Treasurer Joe Hockey some $7.6 billion was cut from Foreign Aid. The Mid year Economic Review at the end of 2014 slashed a further $3.7 billion. Much of this budget was used for funding needed basic infrastructure, disaster reduction, climate adaptation and building community resilience programs in Pacific nations. ActionAid Australia’s Deputy Executive Director, Michelle Higelin, spoke from the third World Conference on Disaster Risk Reduction in Sendai. In her statement she called for all developed countries, including Australia, to to commit at least 5% of their official development assistance to disaster risk reduction, and restore Australia's Foreign Aid budget to 0.5% of Australia's gross national income. "Everything that’s come out of the negotiations ahead of this conference indicates that the ambition of global leaders is falling short, and it will not achieve the outcomes needed to protect the world’s most vulnerable groups going forward,” Ms Higelin said. “Cyclone Pam is a devastating but timely reminder that there is no time to lose in making ambitious global commitments to reducing the risk that disasters pose to populations everywhere, and particularly to poor and marginalised in local communities all over the world."